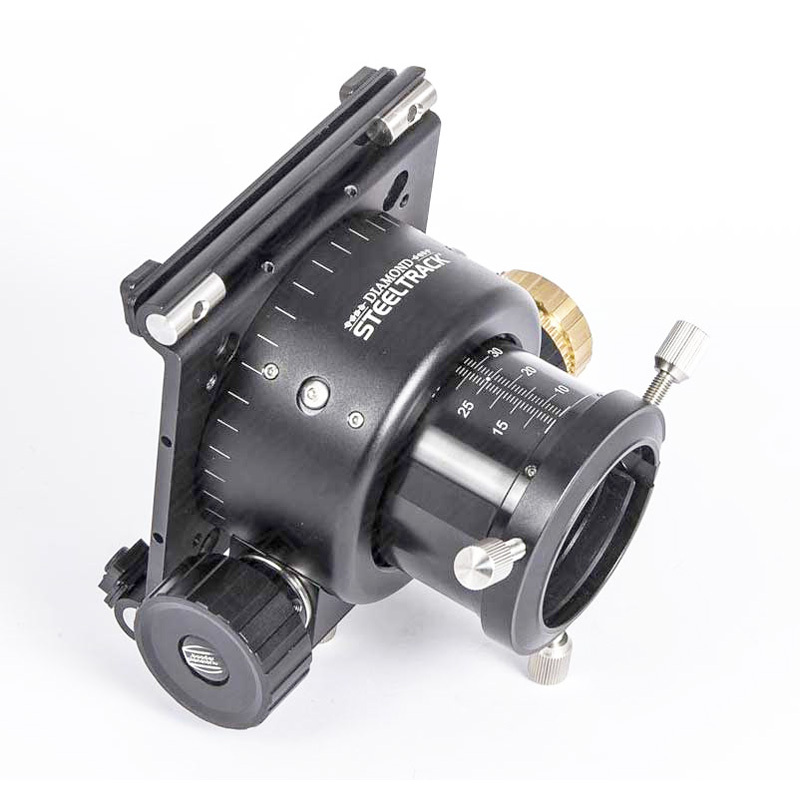 Upgrade practically any Newtonian, small or large, with all of the smoothness, precision, and features of Baader Planetarium's 2" Newtonian Low-Profile Diamond Steeltrack Focuser. Fully baffled and blackened drawtube kills off-axis stray light. Tube hole size of 2.4" diameter required for drawtube clearance. Focuser travel of 40mm (1.57"). Versa-base, fits tubes 8" dia and larger. Center-to-center hold spacing along optical axis = 66mm (minimum) to 93mm (maximum). Center-to-center hole spacing perpendicular to the optical axis = 93mm. Optional NT flat base plate and optional low-profile (1mm) 2"/1.25" Pushfix reducer adapter available separately. Two auxiliary threads (M60x1 and M55x0,75) cut into the NT focusing-tube for attachment of dedicated field flatteners or focal reducers/corrector. This is such a massive upgrade over the stock rack-and-pinion focuser in my C8-N Newt, it's hard to convey. The dual gear ratio is obviously a big plus for tweaking that last little minute adjustment. Installation is straightforward, aided by the video on Baader's web site that shows this exact focuser being installed on my exact scope. You will have to do some drilling. Interestingly, I had to use one of two sets of spacer plates to keep the focuser from apparently contacting the scope body, which is not shown in the video. I could probably take the spacer out and let the scope body deform a little (it was very close) if I needed the extra 1.5mm of in-travel. As it turns out, I didn't need the extra 1.5mm. In fact, I need to use at least a 25mm spacer and wrack the focuser almost completely out to get focus now with an eyepiece, which is great because there is plenty of room for my filter wheel and/or maybe an OAG or AO in the future. The real story here though is that it tracks STRAIGHT and SMOOTH. I can put my collimator in and wrack it from top to bottom and the laser doesn't budge. At 200x magnification, it doesn't move a bit in the frame when adjusting focus, which is pretty amazing. The stock Celestron focuser would move so much just switching direction that the object would go out of view. Note that I do see some image shift with a loaded focuser, which I put down to the the scope body flexing. This isn't a huge surprise with this cheap Newt. I installed the second set of spacers inside the scope to help reinforce the mount area, but it still flexes a bit. I also got the 1.25" to 2" adapter for this focuser and it's a perfect fit.